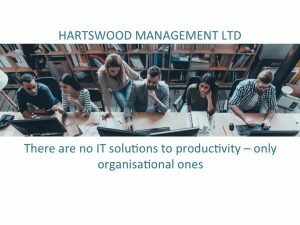 The importance of improving productivity has risen to prominence over the past few weeks and the implementation of IT solutions is often seen as the best way of delivering these improvements. The implementation of a new technology can deliver huge benefits but the challenge is in delivering the whole business solution. However convenient, labeling a delivery as an IT programme or project can significantly limit the understanding of what is needed from the full solution. The business benefit normally requires not only the integration of a number of technologies but business process and organisation changes (eg marketing communications and sales training to deliver increased sales). Successful delivery entails separate technology experts working together as a team. This can be especially challenging when there are many conflicting priorities for the time of these key people. Testing and sign-off needs members of the business functions to test for satisfactory business continuity both prior to and post implementation. Helping them to know what really needs testing may be a challenge in itself. Successful implementation necessitates the engagement of many IT and business functions. For example how will technology be maintained, supported and monitored, and will this require additional staff or changes to support patterns? Who will handle the training and communication for staff and customers? Post-implementation learning and issue resolution will be needed to ensure that the maximum benefit is delivered but the specialists may feel that this process challenges their competence. Therefore initiatives that are labeled as IT programmes and projects are destined to be too focused and to deliver an IT technology that may result in little business benefit. Ensure that the technical solution is proven and “debugged” in a test environment before it is deployed “in anger” in a business project. Develop a solution architecture that covers not only the technical solution but also the ongoing support requirements and the solution for the business functions. Use a sponsor and programme manager who have the strengths of seeing the wider business implications and have the proven capability of integrating the efforts of technical and business experts. Implement a structured handover from development to operations to ensure that the promised business benefit does not fall between the gaps. IT technologies have the potential to deliver great advances in productivity but to do so their delivery needs to be seen as a business programme rather than an IT one. Review your IT function – do you have both technical depth and business focus? What needs to be addressed? Review your business functions – do you have business managers who feel comfortable engaging with technical issues and experts? What needs to be addressed? Decide in your senior leadership team how you might integrate your efforts more effectively to exploit IT technologies to realise deep business benefits. Read Changing Spots – a systems approach to change management for a structured approach on delivering cross-functional improvement (see www.changingspots.co.uk).